69 Strand offers you a sensational break-away, overlooking the Indian Ocean. 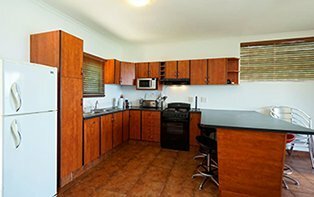 Our 3 self-catering units are located in the Brighton Beach suburb of the Bluff, which is a mere 15 minutes outside of the vibrant city centre of Durban. We are 200 feet above the sea giving you a 180 degree view capturing the Ocean from the sand to the sky, dramatic sunrises and an oceanic experience which will leave you relaxed & revitalized. Spotting whales and dolphins from our private hill side deck overlooking the ocean is often a daily occurrence. From the end of autumn and winter until early summer you will see the most sightings of Humpback whales and their calves. Assuring you of a tranquil stay at 69 Strand. 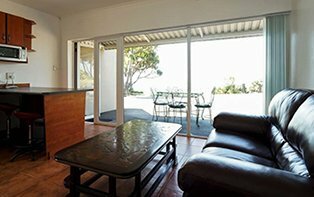 The Beach Apartment can sleep up to four people comfortably. It has two separate air-conditioned bed-rooms, each with a queen sized bed. There is an open plan living area with full satellite DSTV and Wi-Fi. The Beach Studio sleeps up to two people, with one queen size bed in the air-conditioned bedroom with full satellite DSTV. There is an open plan living area, plus Wi-Fi. 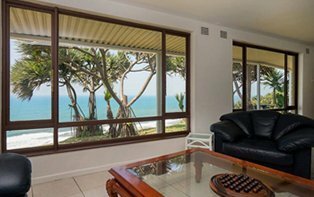 This ground floor unit also has a beautiful sea-view and is a few steps away from the sun-deck that is perched right on the edge. 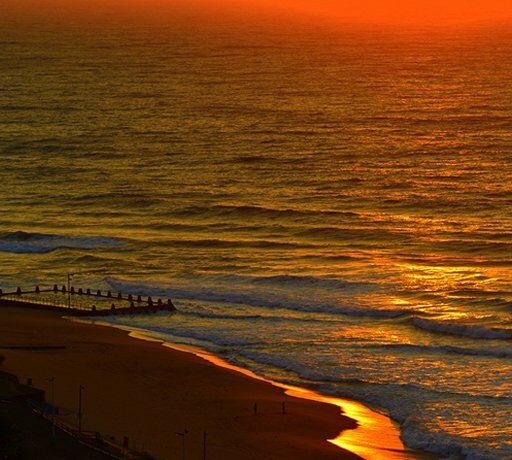 The heart of KwaZulu-Natal and the third largest city in South Africa, Durban is graced with all year-round fantastic weather. With the warm Indian Ocean hugging it’s shores it features an abundance of water sports & activities such as sailing, diving, surfing & body boarding. With an impressive selection of gorgeous beaches one may enjoy, ranging from the more public beaches & associated restaurants, aquariums & water parks to the more private & secluded beach vibe. The sardine run draws aquatic and human audiences on an annual basis with the opportunity to view the marine life in its natural frenzy of activity. With numerous diverse cultural and historical attractions to visit and an endless varity of cuisine to enjoy, bundled with the many outdoor activities & water sports, Durban is a definite must stop when visiting South Africa. © 2006 - 2019 | 69 Strand. All rights reserved.